where would you put thangs? I have a 12’x32’ storage building I am going to use for woodworking. It does not have room for overhead storage. I am here to ask for floor plan ideas. On one long side, there is a 6’ wide door and 1 window on each side of the door. No other doors or windows. So instead of drawing out plans, I put the tools where I thought they would be best, ran power in the ceiling, and went. I’ve been through about four changes over the last ten years that you might call major, all based on my woodworking style, my actual work that I do, and eliminating steps and reaches as I work. Now overall, at least 60-70% of the tools I use on a regular basis are within three or four steps of where I stand. It is not an optimal shop by any means, but it plays out fine for me and what I do. I did take into consideration long boards, and how to cut them when I first laid it out. Take advantage of your door. 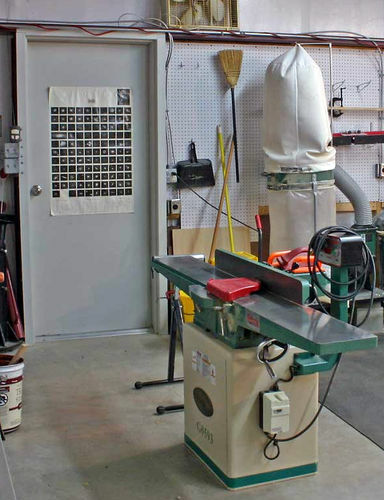 In my shop I point the outfeed of my jointer out the walk-in door. I don’t always need that extra room, but when I joint a long board, it comes in handy to open the door. Mounting the planer, even temporarily, on top of a movable bench, comes in handy as well. My planer can just be lifted off easily, when extra bench space is needed. Looks like everything you have could be put on a mobile base if it isn’t already. Also looks like everything is 110v, so no need to be tied to a specific outlet. As Tennessee said, needs change as your projects change and your style evolves. Keep your options open and allow your tools to float around you. Thanks, y’all, I preciate the suggestions. everything possible should be on wheels. 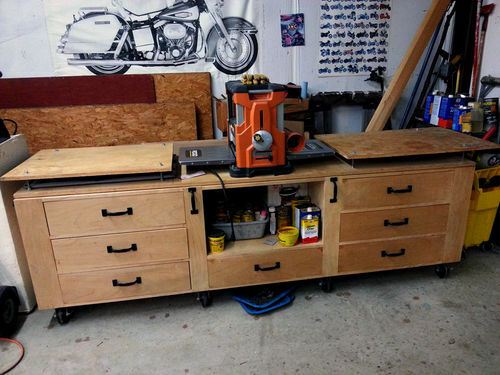 if you want the table saw to be stationary, that could be just off the center of the walk-in aisle. my friend cut a trap door in the wall right behind his table saw to accommodate those extra long boards. he had the braces on the outside to catch the run out. he was a boat builder and dealt with long stuff regularly. good luck on your new space ! your tools and floor plan are very similar to my last shop which was 13’ x 27’. I wish I had some pictures to share but I don’t, so I’ll try to describe how I was set up. I really liked the workflow, it was very efficient for my style of woodworking which is power tool oriented. Table saw dead center of the room running lengthwise. When facing in the direction you would feed the table saw, my long left wall had a door in the center. bottom left wall was a wood rack, top left was radial arm saw. on the short wall (infeed side of the TS) was my workbench and hand tools. Other short wall had my drill press and a shaper. Long right wall, starting from the workbench end had a belt/disc sander, jointer, bandsaw and lathe. The material flow worked well in that shop- long boards came off the wood rack right onto the RAS to rough CTL, then I could easily work between the TS, jointer and RAS to get parts to final dimensions. My current shop, while slightly larger, is basically the same layout. There are a couple of photos of my current version in my workshop section of my profile. Current shop is 16×33 so slightly larger but same general idea.